Nic has stolen the central bank with his band, but police are behind them and you have to protect the armored truck from police attacks. 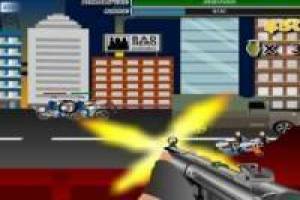 Shoot the cops with your machine gun to get money and exchange it for better weapons. 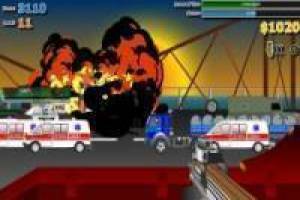 Aim and shoot mercilessly bursting all the enemies you see on the road. Do not let them take the loot!. Move the mouse to aim and shoot if you want to just press the left mouse button. The keypad numbers to switch weapons serve more easily. Move like flash mode in GTA V free flash without hacked them to nag. Remember you do not need to download GTA V flash to play, you just have to give the play. 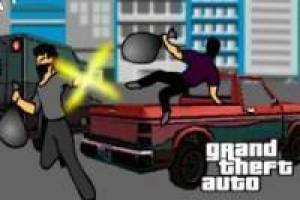 Enjoy the game Gta v: Flash, it's free, it's one of our gta: san andreas games we've selected.